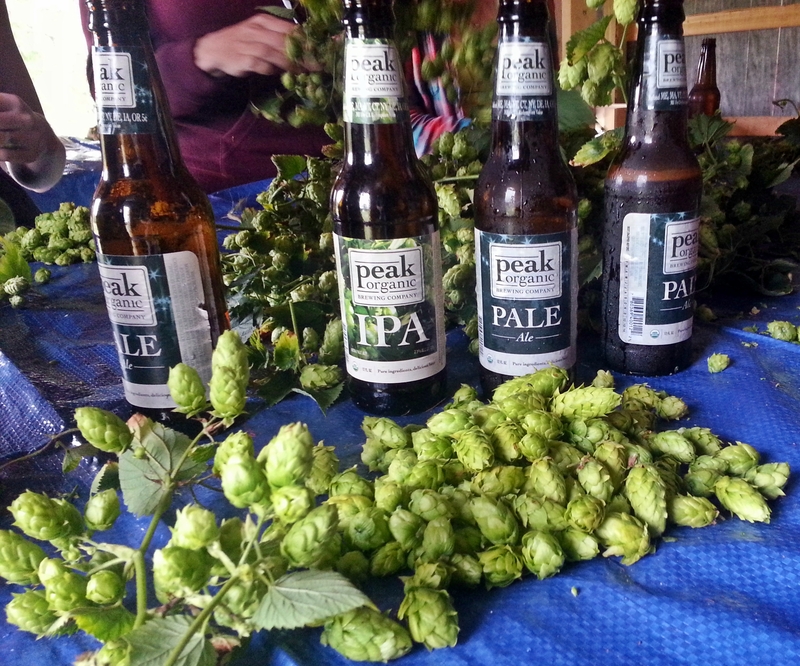 Each year Jon from Peak Organic travels around the State visiting hop farms to collect locally grown hops for his local harvest series. He asked people to join him at Elm Hill Farm to pick some hops. This was my chance to meet up with Jon and also to talk to Arthur – owner of Elm Hill Farm so I made the trek to Monroe, Maine. I arrived shortly after the 1:00 start time and there were several others on the farm. The weather forecast was for 90 degree heat and sun but when I arrived it was 70 and raining. Guess that is what you get when live in Maine. Arthur has a nice building with for harvesting the hops and had 2 tables setup with some hop vines already cut and waiting for us to pluck. After a short demonstration on how to properly detach the hop from the vine we were ready to go. About 15 people were there and everyone was very friendly chatting about beer, hops and anything else that came up. 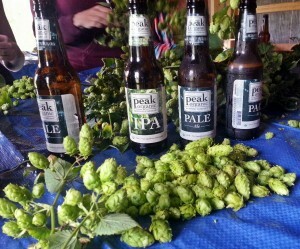 There was also plenty of Peak Organic beer which certainly made the process that much more enjoyable. While we were busy in the shed Arthur went out to cut more vines and kept us busy for a little over an hour. At that point we had filled the hop drying bins and we were done for the day. Many of the helpers headed off to Monroe falls for a swim but I headed home as it was Friday and I wanted to start my weekend. Arthur’s farm produces hops that are used by many local breweries. The day before I was there Atlantic Brewing was there picking up their hops and the week before Sebago Brewing took a bunch for their local harvest beer. At this point there are 5 or 6 viable hop farms in Maine producing a very small amount of hops but the brewers seem eager to use everything they can produce in their brewing. 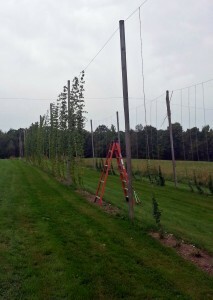 Hopefully farmers and craft beer enthusiasts will continue to plant and grow hops in the Northeast so we can be a little more self sufficient and provide the many craft brewers in Maine with a quality product they can use in their beer. 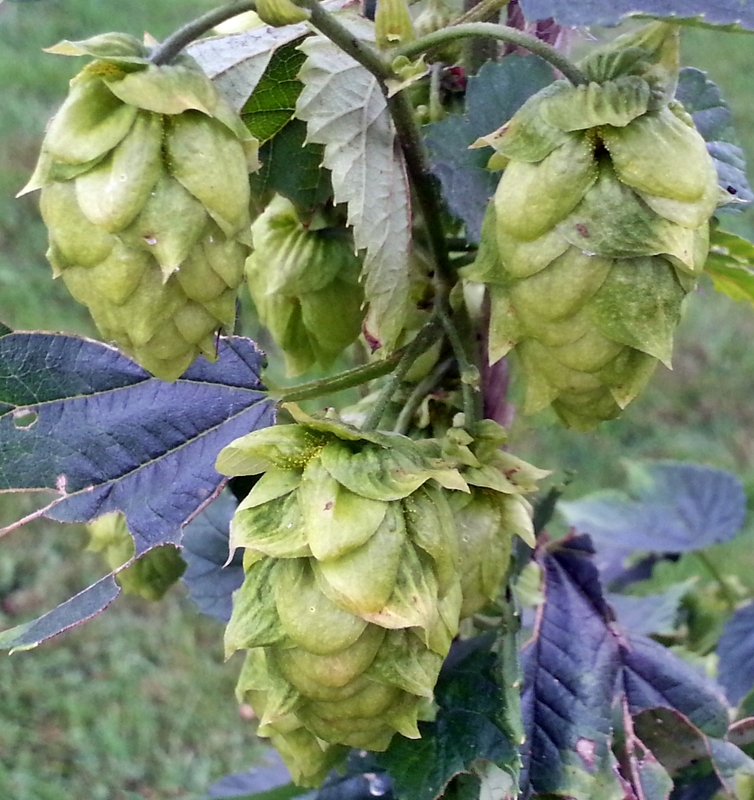 If you have a chance to attend a brewers hop picking party go for it. Sure to be lots of fun as you will be around others that enjoy craft beer.